Bill Martin loves working inside schools to build positive learning environments for children. He has done this for 49 years. He taught in primary and middle schools for 17 years, was a secondary assistant and high school principal for 16 years. On two occasions he led large schools to win State and National Blue Ribbon awards for excellence. Since 2003 he has worked with over 150 schools across six countries to support efforts to create powerful learning cultures. He has earned personal awards for educational leadership: in 1991 he was one of five finalists in the first National Secondary Principal of the Year competition sponsored by the NASSP and Metropolitan Life. 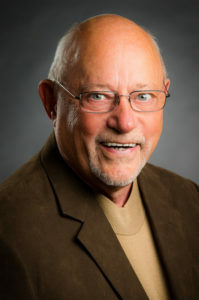 In 1993 he was named one of ten Principals of Leadership by the National School Safety Center. In 2000 the Michigan State Legislature proclaimed a Special Tribute to Bill’s leadership as principal of Monroe High School. In 2001 Bill was invited to be a Visiting Professor of Educational Leadership at the University of Toledo in Toledo, Ohio. While there Bill was a Co-director of the Design Team for the University’s Center of Reform in Education. Dr John Edwards has been a researcher all of his life. Firstly he did research in metallurgy. Then he began working as a high school science teacher and researched student thinking in his own classrooms. Over the following twenty nine years, John explored many areas of education and learning, focusing mainly on how people think and the direct teaching of thinking. This finally morphed into similar research in business and industry. At the same time, Bill Martin was learning about how to teach, how to learn and how to lead inside schools. He started in elementary schools and finished in high schools. For thirty-five years Bill focussed on improving his own thinking, and that of his staff and children. He also realised that the whole school community must align and work together to deliver at the highest levels. So, how did these two meet? In 1988 Bill attended a U.S. Critical Thinking Conference and went to a session by an Australian researcher. John was presenting on two topics: what goes inside the heads of children while teachers are teaching, and how do humans change. Both of these topics hit Bill’s sweet spot. For the next ten years Bill and his staff worked on blending the research of John and his colleagues with their own practical experience. In this period John was pushing ahead with his new research on thinking in business and industry, looking at how adults think and learn on-the-job. Bill had led one middle school to a National Blue Ribbon Award, and had a high school well on the way to similar success. 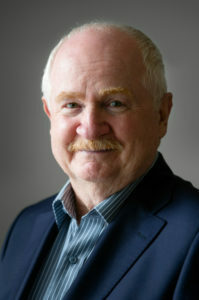 He approached John at a Thinking Conference in Edmonton, Canada and invited him to come to see his research in lived action in a US High School. They shared this experience for three years: challenging each other, refining and refining their shared work and shared insights. Research and practice were butting up hard against each other. John saw the best leader he had seen in forty years of work across many sectors, someone who walked the talk of innovative leadership. Bill saw the most practical of researchers, someone who was happy to dive into exploring school complexities and classroom realities. They decided to team up and work together inside schools across the world to help school leaders, teachers and communities back themselves to create the schools they had always wanted. 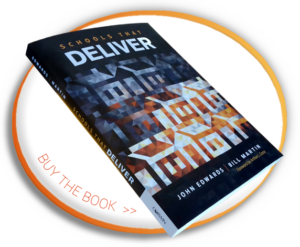 Bill left leading schools, and John left the university, to do work they felt was more important and more innovative than they could deliver inside those institutions. The book Schools That Deliver describes what has flowed from this close collaboration over the last thirteen years.